The weather at the start was very inauspicious with dark grey clouds and feeling very cool. Only one other person turned up by the start, a committee member from a neighbouring branch, so we set off along the dyke, more in hope than belief that we would see anything ! However, careful scouring of the banks and searching along the sheltered bottom of the dyke turned up 2 Dingy Skippers and a Common Blue laying low in the vegetation as the rain began to fall, as well as several feebly fluttering Common Heath moths. We also found a strikingly coloured Yellow-tail moth larva, but some desultory shaking of various hawthorn boughs failed to dislodge any cowering Green Hairstreaks though, and after reaching the 'Bomber Gap' and the rain having set in with an earnestness we decided to call it a day and walked back to the cars. A shame, as the butterfly riches of the Dyke in May in good weather are very worthwhile taking in. Ten of us gathered at the car park of Stour Wood RSPB reserve near the Essex coast, and were treated to regular patrolling White Admirals from the very beginning, as warden Rick Vonk explained about the success they have had conserving the White Admiral on the site. From an initial one or two territories, careful management of the rides and honeysuckle had lead to some 20 territories spread through the wood, and essentially every possible area was occupied by the species. After the initial talk, we went into the wood and spent some time at one of the ‘hotspots’, getting excellent views of this elegant and beautiful butterfly, with its unique gliding flight. There were plenty of other species on the wing in the area as well, with Ringlet, Comma, Red Admiral and Speckled Wood and so on adding to the interest. Thereafter, the group split up, with some of us joining Rick on his regular weekly monitoring transect, while the rest explored the wood at their own pace. Rick explained how the way the wood is managed is almost ideal for this species, although of course it also benefits a great array of other species, from plants and butterflies to birds and bats. A different area of the sweet chestnut and other trees are coppiced each year, and then left to grow back for about 20 years before being coppiced again. This creates large open areas that, after a few years, fill up with lots of flowering plants, supplying nectar to insects and dense cover for birds. During the later stages of growth, ideal conditions develop for White Admirals to breed – they lay their eggs on honeysuckle, but prefer it in the shade of a tree canopy. By coppicing different areas each year, the sunny areas favoured by the adults and the shady areas for breeding are spread through the wood in a nice mixture. The ride management is even more important for White Admirals. The favoured locations for territories appear to be along ‘edges’, where a sunny patch of bramble is adjacent to a tall look-out tree, with shady breeding habitat close by. These conditions are maintained by selective coppicing, tree felling, ride cutting to rejuvenate the bramble and recreate sunny spots while maintaining shade at the same time. During felling operations, one critical aspect of habitat management, perhaps unique for this site, is that great care is taken to maintain honeysuckle. Any trees with honeysuckle growing on that need felling are dealt with by removing the honeysuckle, still rooted, and then replacing it on an adjacent tree. White Admirals spend the winter as small larvae still attached to their foodplant, so removing the honeysuckle in winter, as might be the case in most forestry operations, reduces the survival rate for the species. Although we met nice and early, at 10.30 am, the weather was already very hot, and the Admirals were fully charged and few good chances for photographing these splendid butterflies presented themselves. Carl Blamire had sensibly arrived even earlier, and had managed a few shots as they started to warm up! The butterflies would settle on Bramble flowers for a few seconds to feed before launching off into a rapid patrol flight of their territory, possibly chasing another White Admiral, or settling on a high tree to survey their ‘patch’. They are highly territorial so it would be rare to get more than one individual in a sunny glade, but everywhere we went there were White Admirals to be seen. 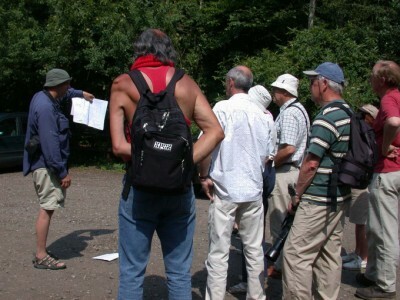 Three of us accompanied Rick on his transect walk. As we entered one section, which comprised a shady lane running between the main coppice woodland and a more open area of meadow and the estuary, Rick explained that this section was ‘never any good’ and he sped up a bit. A large insect flew across the path behind him, and was spotted by Carl and your author – who recognised it as a Hornet Clearwing moth! We called Rick back and he was extremely excited to see the moth settled on the trunk of a tree, drying its wings off after, we presume, having just emerged from it’s pupal case. This was the first time any of us had seen the species, and the first record for the reserve. We found a second individual close by, and several exit holes at the base of sickly-looking Aspen trees, one of which had an empty pupal case present – so we could confirm breeding on site. This moth is an excellent mimic of Hornets, and is about the same size – quite extraordinary! The larvae feed on the wood of poplar species. The adults are rarely seen as they fly rapidly during the day, and do not come to light traps like other moths. Some clearwing species can be attracted to artificial pheromone lures but apparently no lures have yet been synthesised that work for this species. 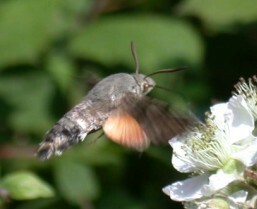 While we were on the transect, some of the others found another great day-flying moth – the Hummingbird Hawkmoth. 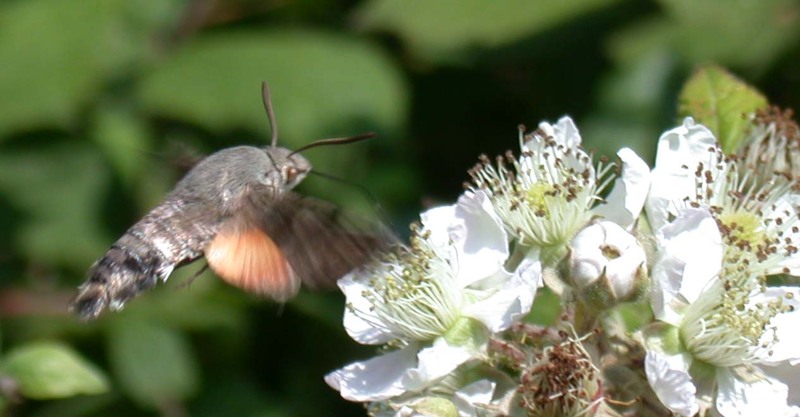 The site regularly has one or two Broad-bordered Bee Hawkmoths annually, which can be confused with this species if not seen well, but the excellent photo by Louise Bacon clearly shows it was the migrant ‘HBHM’ not the rare resident BBBHM! The latter species, like White Admiral, uses honeysuckle as it’s larval foodplant, and is presumed to benefit from the habitat management in the same way as the butterfly.